The Hull and Barnsley Railway of 1880 was one of the last large-scale railway companies (apart from the Barry Railway and the LD&ECR) to be formed and built in Victorian England. The railway was conceived out of Hull's jealousy of the North Eastern Railway (NER) with its perceived diversion of trade through neighbouring ports. It was a poorly conceived scheme beset with early bickering and the creation of a difficult route through large chalk hills. The attendant tunnels and deep cuttings were financially crippling, returns were inadequate to ensure a secure future. 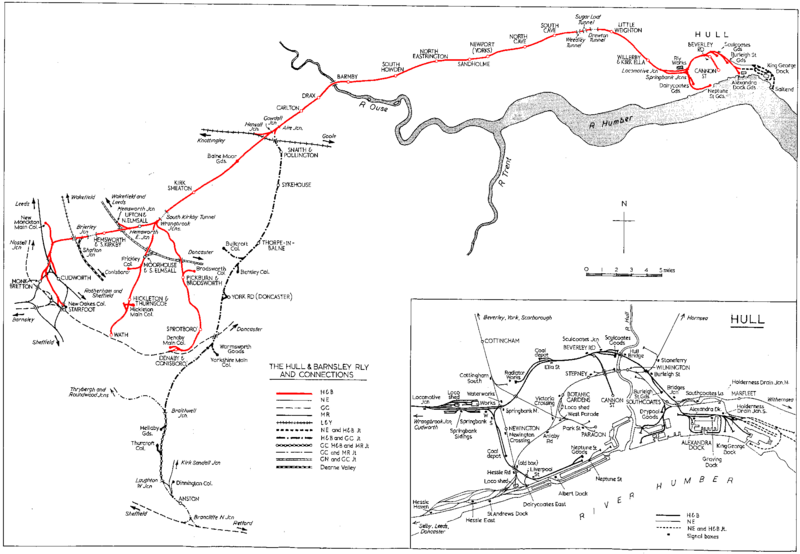 The H&BR had no alternative, the NER had the long established level route more or less along the Humber Bank. A practical consequence of this route is the current"high level" route into Hull, famed for eliminating numerous and troublesome level crossings in the city. From about 1900 onwards, the H&B was in profit and paying a healthy dividend. 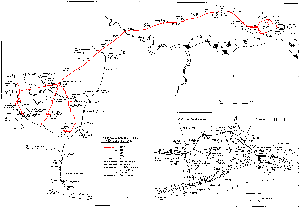 The line suffered low profitability during the Great War, but had begun to recover well after the cessation of hostilities. Thank you to John Broadwell for the above introduction and many of the above H&BR pages. Thank you to Mr B Hinchliffe, Editor of The Hull & Barnsley Railway - Volume 2 for permission to reproduce the map above.